I am happy to announce the solo exhibition, Cloud Level, organized by Gaye Chan at the University of Hawai'i at Manoa. The exhibition highlights work that uses a combination of intaglio and screen print to depict landscapes diminished by massive oceans or infinite skies. Prints include Pouring on Jamestown, picturing the eastern side of Conanicut Island in Narragansett Bay, Rhode Island, where impending storms of layered clouds hang low over the land; Winter Flounder, based on an old freeway exit ramp that, during cold months, transports the driver to an icy world with stone cliffs that resemble a mountain pass; and Leave Your Troubles Behind where an oddly monumental sun casts a golden glimmer on the ocean, fireworks explode in the distance and a small fishing vessel hurries away followed by a shrouded sea creature. Cloud Level is on view at the Commons Gallery at the University of Hawai’i at Manoa from January 7 - February 8, 2019. The exhibition runs concurrently with the Honolulu Printmakers 91st Annual Juried Exhibition, Juried by Jeffrey Dell, in the Main Gallery. In support of the AS220 Community Printshop this year I donated Snow Leopard to the Print Lottery 2018 Fundraiser, as well as an edition of Niagara & Visitor prints. The edition of 20 sold out on September 28, 2018. St. Anselm College, Comiskey Art Center, hosted Allison Bianco: Glacial Drift which was on view April 19 - May 20, 2018. Organized by Kimberly Kersey Asbury, Josh Dannin and Tauna Sisco, the show featured new prints and included an artist talk and printmaking workshops for students in the Conversatio and Studio Art courses. The Print Little Gramma Near the End is included in the exhibition Emphasized at the Hawai'i State Art Museum. from HISAM: Through a selection of work from the Art in Public Places collection this exhibition explores the various ways that artists play with scale, and how this in turn affects the viewers' responses and understanding. Leave Your Troubles Behind was selected for inclusion in an article entitled, What You Need to Know About Edition, written by Yoon Sae Hee. 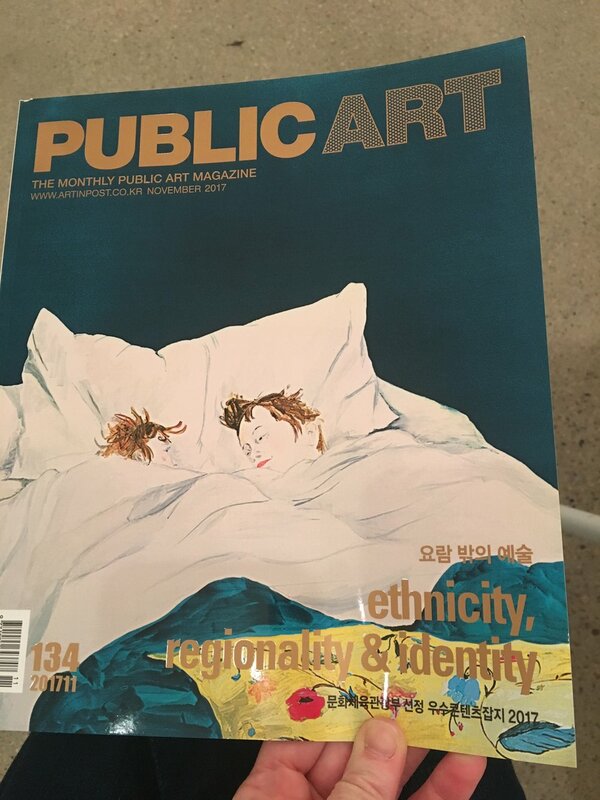 The article appears in the November 2017 edition of the South Korean publication, Public Art. The Old Jamestown Bridge series was selected for inclusion in Beauty of Mokuhanga: Discipline and Sensibility in conjunction with the International Mokuhanga Conference 2017, held at the University of Hawai‘i at Manoa. from UH Manoa: The juried international exhibition Beauty of Mokuhanga: Discipline & Sensibility celebrates the Third International Mokuhanga Conference, which is being held outside of Japan for the first time. Mokuhanga, a traditional Japanese woodblock printing technique, is widely recognized through ukiyo-e prints that were popular during the Edo period (1603–1868). The Old Jamestown Bridge Series was selected by Kathryn Wat, Chief Curator at the National Museum of Women in the Arts, Washington, DC, for inclusion in Making Your Mark, an exhibition at the Providence Art Club, Providence, RI, which will be on display April 2-22, 2017. The opening reception is free and open to the public, and will be held on Sunday, April 2 from 2-4pm. The sea is the central character in Allison Bianco’s Atlantic Time a collection of intaglio and screen printed works inspired by the Rhode Island coastline and defined by the artist’s efforts to reconcile that present-day, real-life seascape with the more nebulous one that exists in her memory and imagination. The Sinking of Matunuck is a panoramic triptych of the tiny beach community where Bianco spent her childhood summers. Here the meticulously etched landscape is augmented by the accidental nuances of the printing process itself; fingerprints become distant storm clouds, and wire brush marks become wisps of wind carrying flying debris across the sky. A screen-printed layer of glow-in-the-dark pink represents the real-life menace of rising sea levels that threaten to swallow the community whole, while the arc of a dayglo rainbow suggests a future much less grim. Bright screen-printed overlays also reimagine the landscape in Later that Day at Second Beach, a series of six panels set on the cliffs of Middletown, RI. Here jagged, etched rocks and a bright orange sea sit below an aquatint sky punctuated by the loping arcs of pink fireworks. The scene looks backwards to Hiroshige’s Fireworks over Ryogoku Bridge but somehow feels more like a futuristic landscape from a distant planet. Hiroshige’s influence is also present in Leave Your Troubles Behind, where a monolithic sun hovers over the Block Island shore. A googly-eyed sea creature is screen printed over the intaglio, hinting at the humor suggested by the piece’s title -- a reference to the silly TV jingle used in commercials for the Block Island ferry. Similar creatures appear from the dark waters in The Old Jamestown Bridge series, a set of three prints depicting the destruction of the rickety structure that used to connect Conanicut Island to the mainland. Allison Bianco: Atlantic Time was curated by Michele L’Heureux, Gallery Director at the Wheaton College Beard and Weil Galleries during the winter of 2016/17. A catalogue was published in conjunction with the exhibition. Installation photo credit, Scott Lapham. 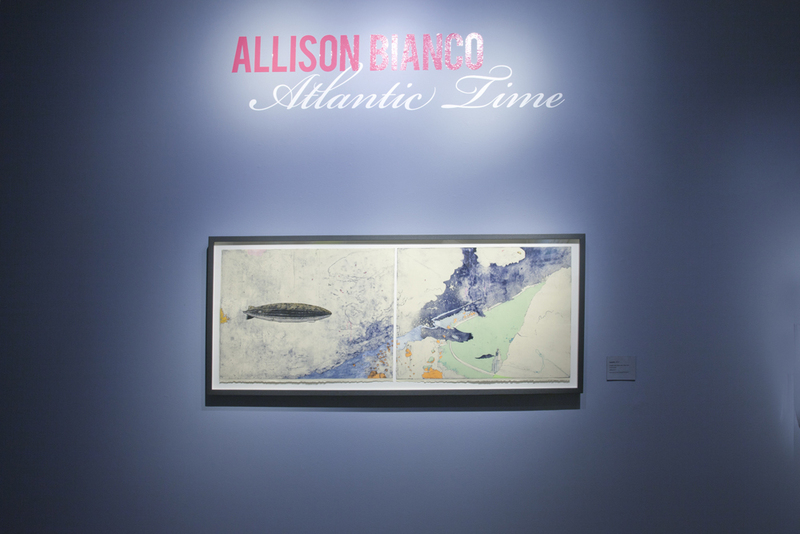 Wheaton College sits less than 30 miles from the Rhode Island coastline, which features prominently in Allison Bianco’s exhibition Atlantic Time. Moreover, Wheaton’s students hail from many coastal communities around the globe—including California, Maine, and Florida, and as far away as Venezuela, Argentina, and the United Arab Emirates. For most of these students, returning home after short or long periods of time is fraught with emotion, possibility, and nostalgia. It is this kind of nostalgia—inspired by her own Rhode Island homecoming after living in Hawai’i for a time—that informs Allison Bianco’s prints. Exquisitely drawn coastal panoramas recede into richly colored, dreamy landscapes that evoke childhood memories and the passage of time. Who better to understand the cycles of change that people and their environments undergo over time than the college student who returns home year after year to find familiar landscapes—and themselves—changed forever? Furthermore, Bianco’s impeccable craftsmanship and innovative layering of printmaking techniques is not only an inspiration to Wheaton’s budding artists but is also the ideal vehicle for a nuanced and textured examination of nostalgia, a sentiment familiar to most. Wheaton College’s philosophy is predicated on collaboration, and in that spirit, this exhibition allowed me to collaborate with Cade Tompkins Projects of Providence, RI, for which I am grateful. Cade Tompkins has been a superb advocate for Allison Bianco’s work, as well as for dozens of other emerging and established contemporary artists, through her gallery exhibitions and collaborations with leading institutions throughout the United States, and I am thankful for her hard work and generosity. Allison Bianco: Atlantic Time will open at the Wheaton College Weil Gallery, Norton, MA on December 1, 2016. Opening reception: 5:30-8pm in the Watson Fine Arts Building. Atlantic Time will be accompanied by an artist catalogue, with forward by Michele L'Heureux, Gallery Director and essay by Britany Salsbury, Andrew W. Mellon Curatorial Fellow, Department of Prints, Drawings and Photographs, RISD Museum. On view in the surrounding Beard Gallery will be a student curated exhibition of work from the Wheaton College permanent collection, exploring the theme of water. Announcing the new print Streaming 2016, debuting at Cade Tompkins Projects satellite exhibition, Art in Airstream, during the IFPDA Print Fair, Park Avenue and 67th Street, New York, NY. Visit the exhibition page to view works for sale. Streaming was printed by Allison Bianco and DWRI Letterpress, partial proceeds to benefit the IFPDA Foundation. This exhibition will span over four galleries across campus, and features over ninety works highlighting the University of San Diego’s broadening collections of prints and Native American art. In the Hoehn Family Galleries, Imprint will highlight the University’s Print Collection, which has experienced exponential growth in the last four years, nearly tripling in size. Most of this growth has been through donations, gifts, and bequests that have been as diverse as the history of the graphic arts itself. Recent acquisitions have reached as far back as the 15th century, and include major works from Asia, Europe, Latin America, and the U.S. Also featured are works by seminal graphic artists such as Albrecht Dürer, Hendrick Goltzius, Edward Munch, James McNeill Whistler and Anthony van Dyck, among others. Read the article by Britany Salsbury here. Cade Tompkins Projects featured a printmaking exhibition by a group of artists whose work expands the boundaries of mokuhanga, the traditional Japanese woodcut process. Mokuhanga is achieved with use of water-based inks, hand-printing techniques and Japanese-style printing papers. The prints selected for this show present contemporary imagery and vernacular. Some works adhere strictly to the traditional process and others combine techniques such as etching and hand-stitching. Highlights include Yoonmi Nam’s Oishii, a masterfully minimal image of cut flowers arranged in an everyday drink carton; Daniel Heyman’s hand-printed book, Sing with a Lovely Voice, which presents testimonies of former inmates at Abu Ghraib Prison in Iraq; David Curcio’s MS.45, a nun with a gun, red lips and red nails; Stella Ebner’s silhouetted The Hunters which achieves a deep space with expert layering; Allison Bianco’s The Old Jamestown Bridge picturing the 90s dynamite explosion of the rickety Rhode Island landmark; and Hiroki Morinoue’s Dragonfly Pond, a vibrant pseudo-landscape that exploits the grain of the woodblock to stunning success. Artists in the exhibition include Katie Baldwin, Allison Bianco, David Curcio, Stella Ebner, Kevin Frances, Takuji Hamanaka, Lois Harada, Daniel Heyman, Hiroki Morinoue, Yoonmi Nam, Serena Perrone, Eva Pietzcker, and April Vollmer. Zeppelin was acquired by the Philadelphia Museum of Art as a gift of The Print Center, Philadelphia. The print was displayed in an exhibition showcasing a selection of works gifted to the museum over The Print Center's 100 years as a fine arts and printmaking institution. The Philadelphia Museum of Art presents an exhibition of forty-some works culled from more than 1600 donated by The Print Center to the museum since 1929. Curated by Associate Curator of Prints and Drawings Shelley Langdale, the diverse assortment of works on view—from an etching by Hendrick Goltzius (Dutch, 1558-1617) to a lithograph by Jasper Johns (born 1930)—was chosen to highlight the range of The Print Center’s contributions to the Museum’s important collection of American and European prints. This installation commemorates the Museum’s close working relationship with The Print Center in promoting the study and appreciation of fine prints and photographs. Print Love: Celebrating The Print Center at 100 is presented as part of The Print Center 100. 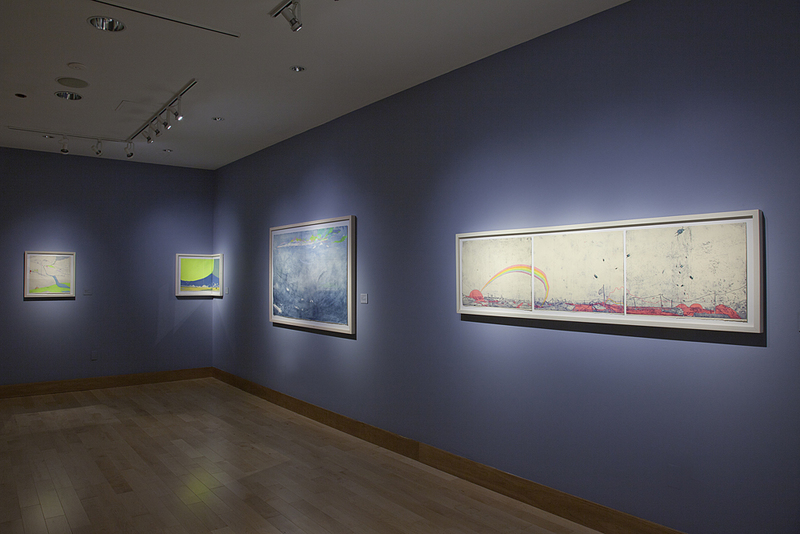 On view October 2, 2015 – January 3, 2016. Raid the Database 2 is a permanent on-line exhibition hosted by the RISD Museum and curated by Nafis White, based on Andy Warhol's 1969 curatorial project, Raid the Icebox, an exhibition of objects in the RISD Museum's archives. Nafis divided the works into 4 categories: Landscape, Abstract, Figurative, and Text and interviewed one artist from each section. See the interview above and read her curatorial statement here.